Propinquity - 1: nearness of blood: Kinship. 2: nearness in place or time: Proximity. The Edge of Propinquity was a series of short stories from different authors in different universes exploring the world that lurks just beneath the surface of everyday life. It is the world of the unexplained, supernatural, magic, horror, duty, responsibility, black humor, conspiracy, unknown heritage and power. This semiprozine was updated on the 15th of every month. 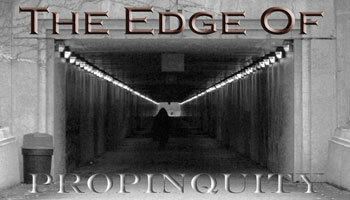 The Edge of Propinquity ran from 2006 until 2011. After six years of publication, the monthly zine closed its doors. These are the archives visitors may wander.